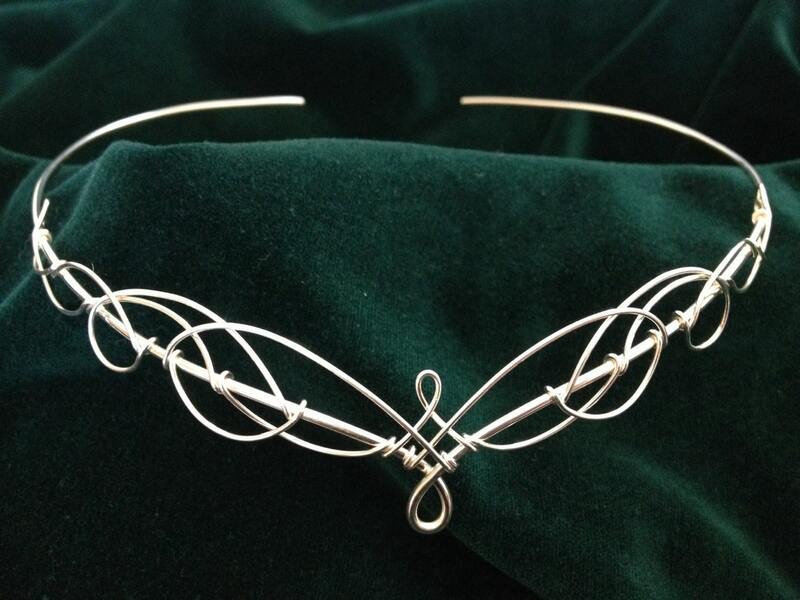 Wonderful celtic elven inspired headpiece, made to be worn over the forehead or on the hairline, this lovely unusual piece is perfect for almost any occasion. 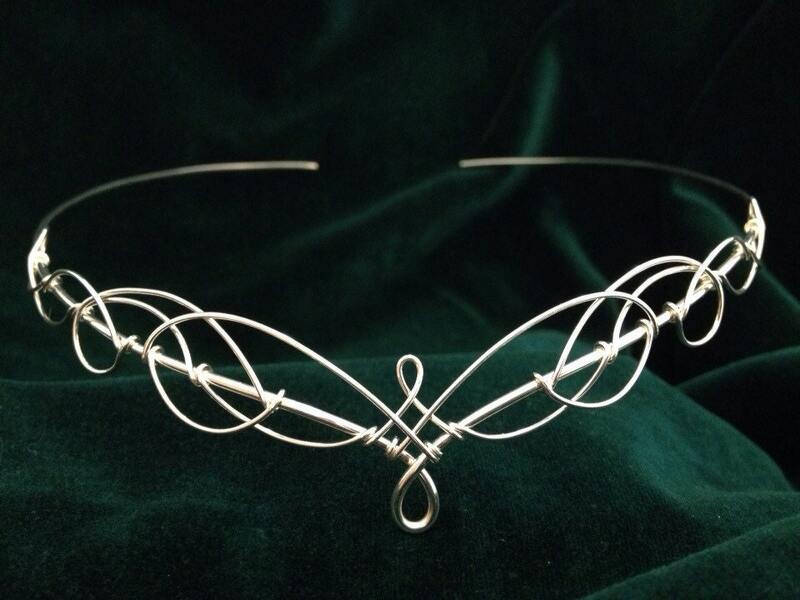 The circlet will be made open at the back and loops added to enable you to add ribbon or cord to tie it into place. It can also be made as shown without the loops and held in place with pins. Because the entire circlet is handmade it is both sturdy and also flexible and therefore very comfortable to wear however because of it's flexibility it will need to be tied or pinned into place. 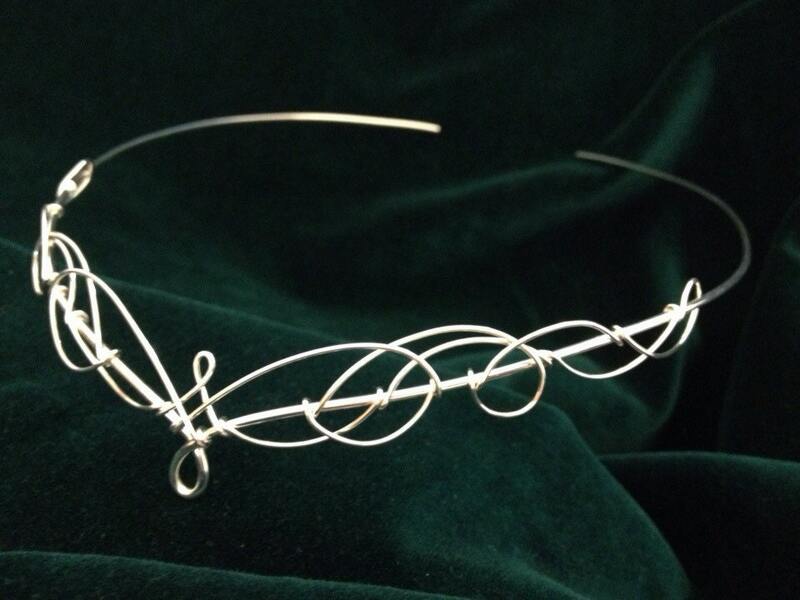 The design element of the circlet measures 18.5cms (just over7 inches) across and measures 22mm (just under 1 inch) from top to bottom at the centre. 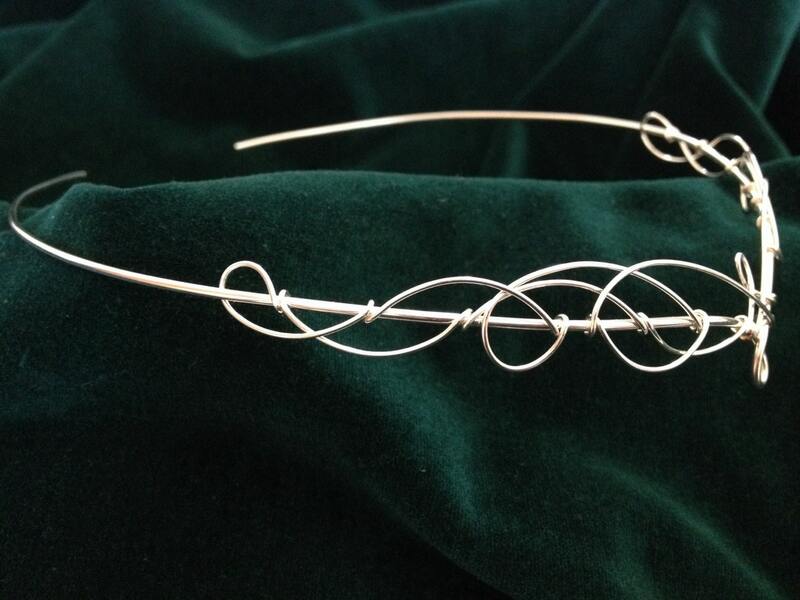 The swirling knot work is made using one continuous length of wire, staying true to the concept of Celtic designs. Perfect for bridal, re-enactment, elven, faerie, or pagan ceremonies. Designed and made in the beautiful English County of Kent. Shipping is via Royal Mail First Class Delivery for UK orders and Standard Airmail for overseas deliveries. Shipping upgrades are available to include insurance and tracking, please ask or choose at the checkout. I accept Paypal and credit cards from everybody, and also cheques from UK residents only. Shipping is via Royal Mail using several options of their service which includes insurance and tracking if required. Rest of the World PLEASE ALLOW THREE WEEKS from dispatch, but could be longer depending on location. On dispatch I will email you the tracking number of your parcel if you have chosen tracked delivery so that you can keep an eye on it's progress to you. I’d like the world to be a greener place. I see no need for excess packaging or plastic where it is not needed. Therefore all of my circlets are carefully wrapped in tissue paper and placed in a recyclable box for its journey to you. The only plastic is the unavoidable document wallet and parcel tape and which is used to secure the box. I hope you like your item when it arrives, however if it's not what you expected then it's absolutely no problem to send it back for a refund. All I ask is that you notify me within 7 days of receipt and return it to me within 14 days. Once it's arrived back here I will issue a full refund minus the return postage. If you find that your item needs to be altered then I will do this at no charge, all I ask is that you pay the postage to send it back to me and I'll alter it and send it back to you. But first please contact me so that we can discuss what you would like done just in case it's not possible. I love both the tiara and the necklace, you can tell the care that went into making them. Shipped VERY fast.